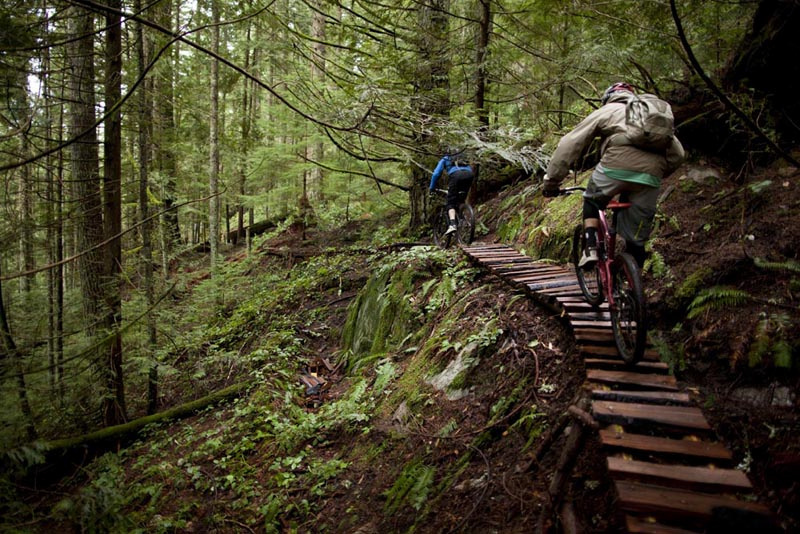 Until May 2011, the North Shore, the birthplace of free-riding, a network of trails contiguous to a metropolitan area of 1.5 million people had no guidebook. Sure there are websites with online maps, sites that aggregate GPS information and trail information and some maps (eg the Cove Production maps and the Seymour NSMBA map). But there is no one single resource that ties this all together. One look though at online forums whether here on Pinkbike or on other venues and you will find many of the same questions again and again. Where do I ride? Where can I rent a bike? Where/how do I even start? Wade Simmons and Sharon Bader have put together a guidebook that will go a long way to filling this knowledge gap. Cover of the "Locals' Guide"
Not many other people could have put together such an undertaking. Wade needs no introduction. He can ride all these trails and then some and has been around almost as long as everyone. Sharon's been the tireless behind-the-scenes advocate for Shore biking. President of the North Shore Mountain Bike Association for 5 years, she knows all the builders, all the trails and more importantly, knows what to put in and what to leave out of such a guide. Sharon and Wade on "Upper Tall Cans" - Cypress. Didn't know there was such a trail? Buy the book! The book is replete with an astounding amount of detail. 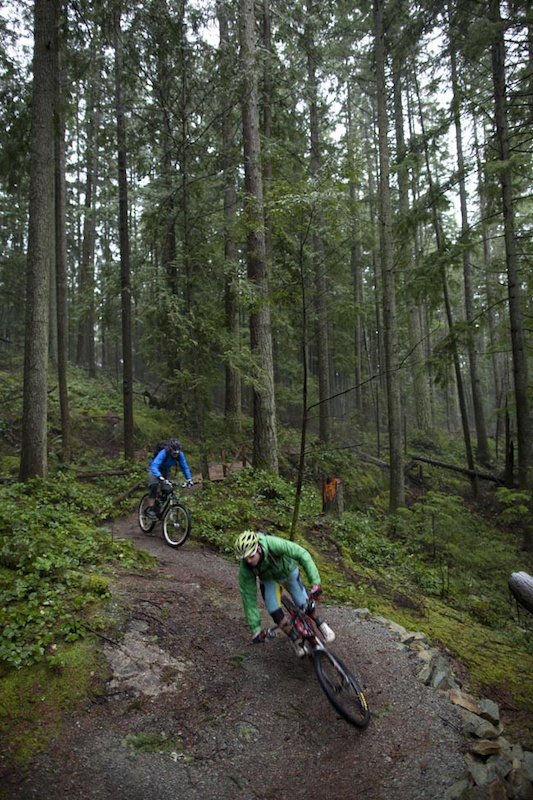 The major trail areas of Cypress, Fromme and Seymour are described. Maps are abundant; there are general overview maps which are then expanded into detailed maps. GPS points are given to help navigate as are trail descriptions. Many locals take navigating the trail system for granted. Although there are signs, there are also many unsigned intersections and it's easy to get lost. 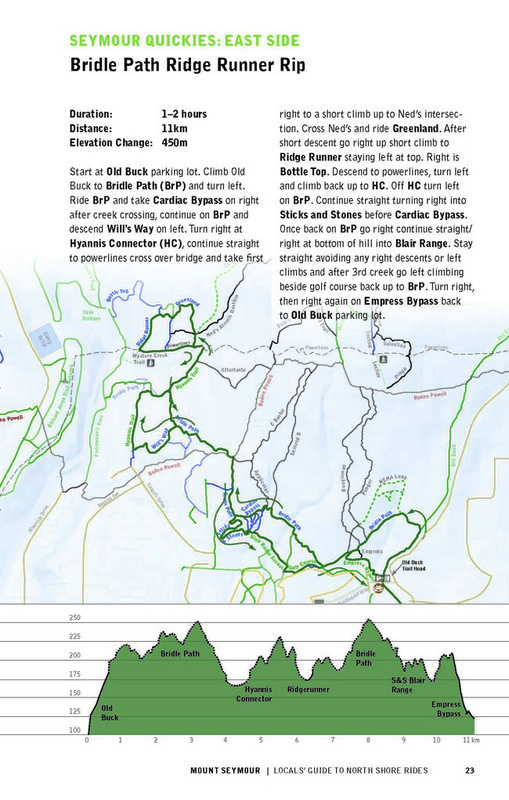 This guidebook might just help you find the trails that you'll want to ride. Sample trail descriptions describe the character of the trail. Didn't know there was a Greenland? Buy the book! The "Locals' Guide" also contains suggested ride descriptions ie. routes recommended as starting points for exploration by Wade and Sharon. Often you might not know that there are ways to link trails in the system so that they logically flow. Or you might not know that "Sticks and Stones" rides more downhill one way and uphill another. Or you might not know that "Dirty Diapers" is a nice variation to 'Neds". Or you might be a tourist who wants the one must-do shuttle run. Or even seasoned locals might not have heard of trails such as "Tall Cans", "Greenland", "SGS" or "Pull Tab". The Locals' Guide won't give you every possible detail, but it will go a long way to letting you learn what is out there and start you on the baseline of exploring and finding out these gems for yourself. The Richard Juryn trail is part of the xc trail system in the Seymour Demonstration Forest. Sample suggested ride description shows a very popular Seymour XC/AM loop. Wilson & everyone who has ever come out to an NSMBA trailday. Wade and Sharon on SGS - Cypress. Never heard of "SGS"? Buy the book! It is with that sentiment that the Locals' Guide" will be periodically donating to trailworkers. The first donation is a cash $100 donation to the "Aftertaste Crew" who brought "My Trail aka everyone-else-calls-it-Aftertaste-so-lets-just-go-with-the-flow" and many other trails into the world. Periodic donations will be made to local Shore builders/workers. 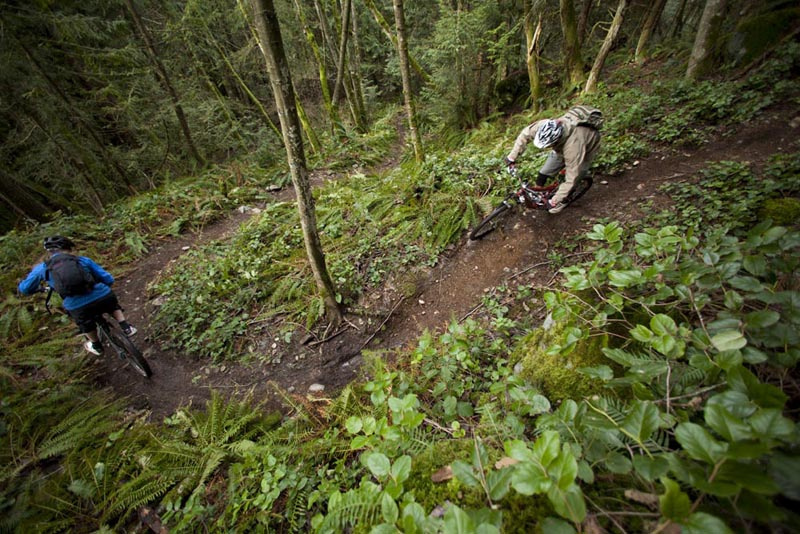 Wade on some greasy Fromme rock. The book is sold at almost all North Vancouver bike shops and at MEC. You can also buy it directly from Wade and Sharon via the website at www.mtbtrails.ca. You can also buy it from the Pinkbike store. 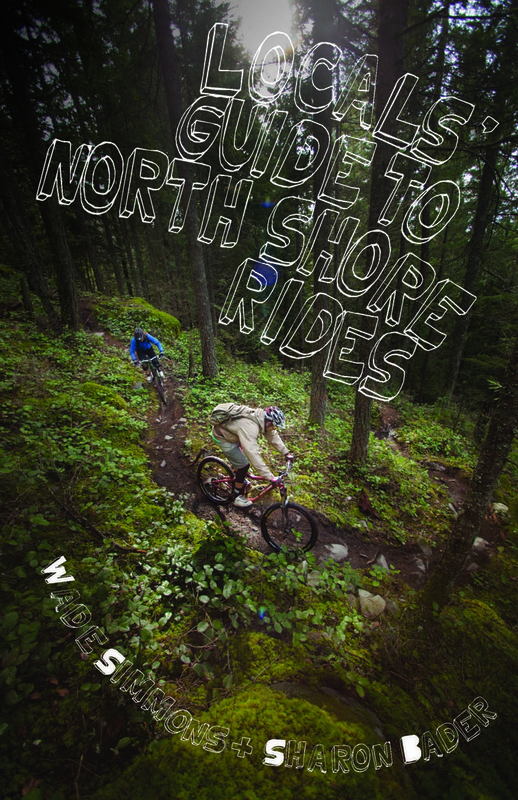 The "Locals' Guide to North Shore Rides" costs $24.95. 83 trails are described in 83 pages. 21 rides are suggested along with GPS and elevation profiles. The guidebook is printed on high-quality paper. It contains pictures kindly provided by Sterling Lorence. Details concerning possible electronic maps, GPS apps and e-books are being worked out and will be announced. This can be the official map of vancouver! Screw downtown! Who needs to shop! Eat, bike, and sleep! Thats how the true b.c. Guys do it! This thread reminds why the mtb community is so great. If this were a book about back country ski stashes or secret surfing spots, people would be howling. Agreed. As a surfer and skier I know the tension behind locals and "outsiders" but I really just want everyone to have the same enjoyment as I get and push the sports. Anyone who comes out to cypress I will be more then willing to show them all the greatest trails... As long as they can keep up. For sure! A pow line can really only be skied once and a surf spot can get crowded quick. 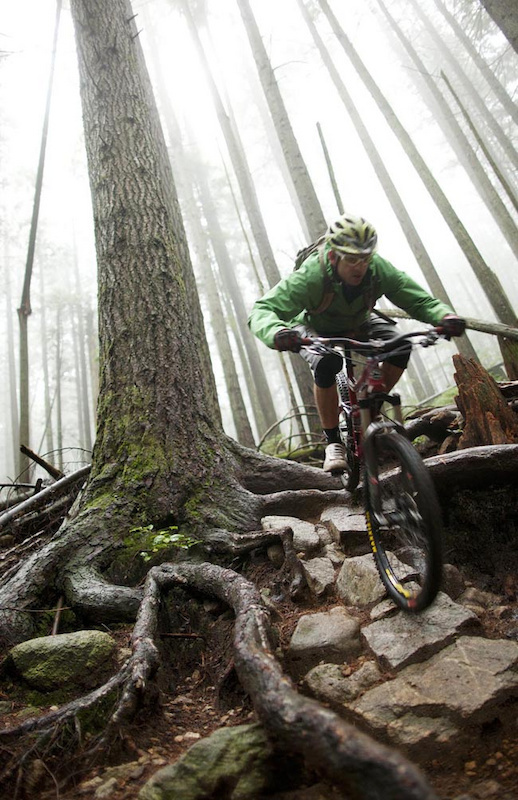 Trails are always fresh and you only take up a fraction of the trail's space at a time. The more the better! jmh7 "trails are always fresh" really? It takes a lot to unfresh a trail, unlike a pillow line. Issue with backcountry skiing and surfing is when you have people on top of one another when an area gets popular. pretty risky. Not much of an issue with a trail. 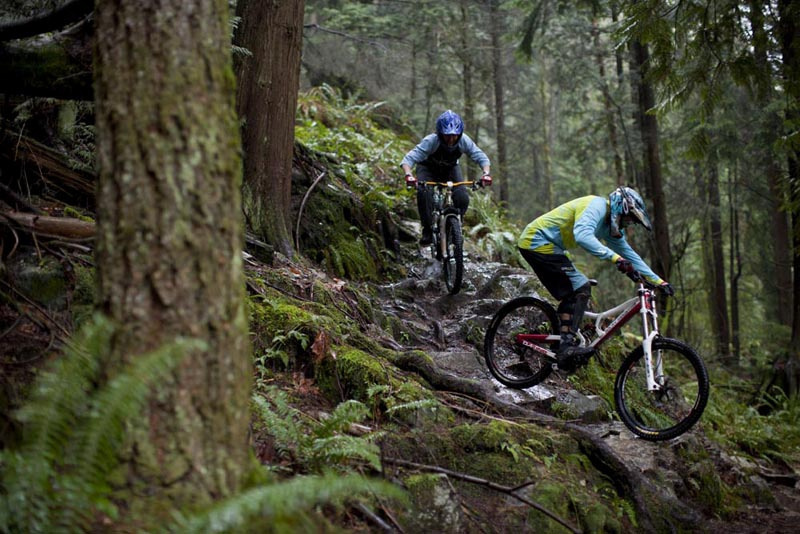 Most of the trails on the North shore are over 10years old. They can handle the traffic! You and many other people! No kidding, when I first moved here from NZ and did my first shore ride I ended up walking most of it, first because I was scared, then because I went head first in to a rock and broke my helmet. A book like this telling me where to start was desperately needed while I was getting to know the shore. Even now 4 years later, I know Fromme quite well, about 1/2 of Seymour and barely any of Cypress - looking forward to expanding my options. FOR THOSE WHO CAN'T AFFORD A 'BOOK' OR WANT TO CARRY SOMETHING WITH THEM ON THEIR RIDES - map guides for Seymour / Fromme / Cypress have been readily available for years [ 10 years for Cove Productions ] - one is also free and handed out by MEC and TD Bank and North Shore Bike Shop; three others as well by Cove Productions, all with comprehensive and easy to read trail images of virtually every trail on those 3 Mountains - as nice as i am sure the 'book' is [ and to have ] i would rather spend $5.99 on a small water proof foldable map guide i can carry with me...in fact if you want to find ALL the trails on the Sunshine Coast, stop in at the only bike shop in Gibsons [ i've forgot the name ] and they sell an awesome map guide to more trails up there than you could ride in your lifetime...hope this helps. Great points you make jcinkits. The Cove Production maps are very good. We wanted to provide a product that's more detailed and with the suggested rides a little more of a resource for beginner/intermediate riders. And yes, it is a size that you can stuff in your xc jersey or easy enough to throw in the pack! At $5.99 per map per mountain, that totals $18, not too far off the "Locals' Guide" price and you don't get the sic Sterling photos and the detailed rides! 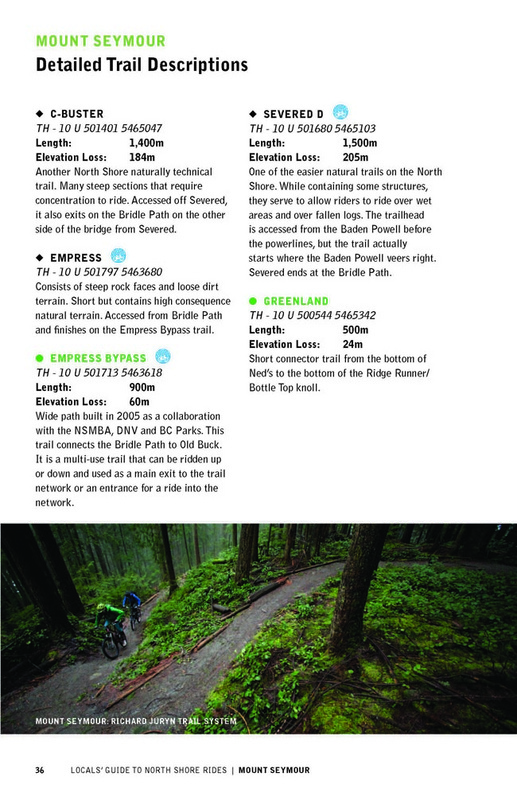 This book provides more trail detail as well as suggested rides. The Cove production maps would make a great addition to this to carry with you if you don't want to carry the book around. The awesome Sterling shots also make it a great addition to the coffee table! The TD Bank/MEC Seymour maps was created by myself as an NSMBA project. I still have about 500 of them and they may find themselves in books sold through our website. jc - I thought that what I said in the first paragraph was correct and not misinformation. If you feel its misinformation could I have expressed it better? "Sure there are websites with online maps, sites that aggregate GPS information and trail information and some maps (eg the Cove Production maps and the Seymour NSMBA map). But there is no one single resource that ties this all together." Thanks for your interests guys! We'll be picking the book up from the printer on Tuesday and getting them to the shops wed/thurs so they'll be available then! You can preorder from pinkbike now! cool jc. Wade is working on the 'off shore' orders. If and when we get an order I'll contact you ! Thanks! Building trails is hard work, I love to share the trails, as long as it is with someone willing to pickup a shovel. If you are just visiting, then it is understood, so long as you build at home and tell me about your trails there. Eat, Drink, Sleep, Build, Ride, Repeat! I'm a local and definitely interested. I keep finding great trails and never stumbling on them again. Problem solved! I grew up riding the shore but have been out of the country for the last 6 years. This will be a nice way to catch up on all the progress that has taken place since I left. Thanks Wade and Sharon! Very cool... Way to produce what looks like an awesomely detailed tutorial of one of the best mountain biking trail systems in the world. This will be a start to people riding on the shore but theres so many secret trails that wont be in that book. It won't be the guide to everthing on the shore but more the better known trails. hoprefully this will get my buddies to stop in vancouver like ive been telling them for years. instead of headding straight to whistler everytime. Looks awesome for beginner riders like myself. Can't wait to pick up a copy! Perfect! Just moved here and this is exactly what we need! I'll be picking up a copy tomorrow. ohhh not out quite yet? Thanks for letting me know! Looks awesome...a little more sunshine and a little less rain and I would be packing my bags to move out there. it never rains here what are you talking about? It only rains twice a week on the Shore, once for 2 days and once for 5 days! Great Idea! Wade is the man to come up with something like this. Congrats. I'll buy mine at MEC next time I'm in. Man that would have come in handy last weekend! Awesome idea! Long Live the North Shore!!! So rad there is a guide!